Right now, all the buzz seems to be around OLED panels because it allows smartphones to become slimmer, has a high level of brightness and conserves power. Unfortunately, only a few phone manufacturers can incorporate it in their devices because rough estimates put OLED screens as being three times more expensive than traditional IPS LCD panels. However, microLED is a new display technology that we’ve all heard and paid attention to momentarily, but there are a vast number of differences between the aforementioned tech and OLED. As a result, their attributes will result in different experiences once present in mobile phones. Here, we explain the differences between microLED and OLED, what benefits they bring to the table and how will they be able to change the smartphone industry in the future. 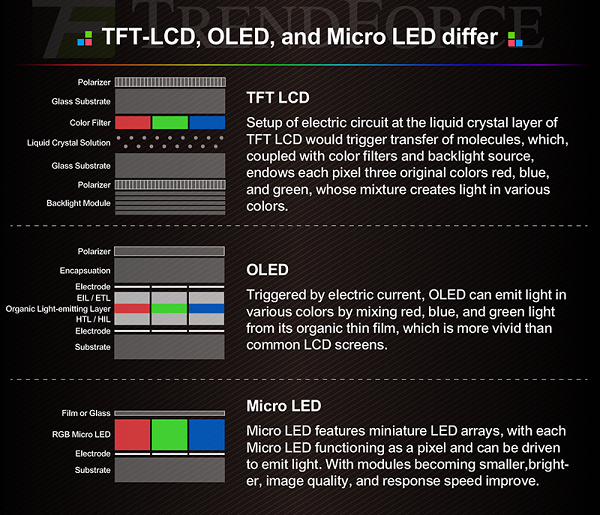 Before we dive into the differences between microLED and OLED, let us talk about how they are similar. If you have not yet noticed, both terms feature the name LED, meaning that these panels are made using LEDs or light emitting diodes. These diodes give off their own light, which is very different from LCD, which needs a dedicated backlight to show a display. As a result, both microLED and OLED panels are able to produce very high contrast ratios and deeper black colors. Since there is no backlight present, when these diodes no longer emit light, they no longer consume power, leading to better battery life. Now let us talk about on how these technologies differ from one another. OLED: Organic Light Emitting Diodes use organic materials. MicroLED: Microscopic Light Emitting Diodes use inorganic materials. Devices can be made thinner because according to Android Authority, there is no polarizing and encapsulation layer. Thanks to this, microLED components can also become very tiny, measuring less than 100µm. This is less than the width of a human hair. 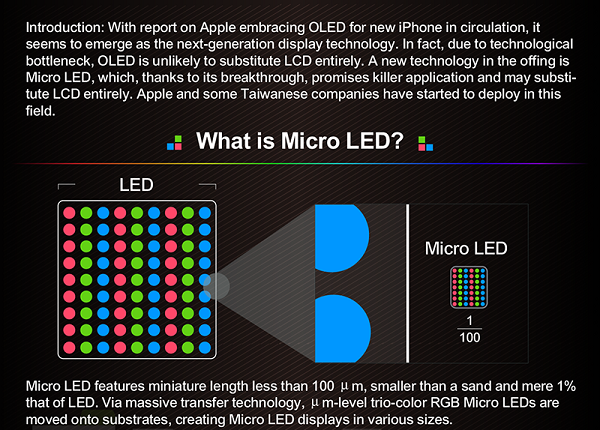 You can also think of microLEDs as shrunk down versions of traditional LEDs. The underlying technology is not new but shrinking the components and placing them on an array is a very expensive and might we add, difficult process. This is why you will notice that microLED technology is found on smartwatches rather than smartphones, for now. Increasing the display size and using microLED to do that is one of the biggest challenges of the display industry. That being said, you can imagine what Samsung must have gone through when it unveiled its 146-inch microLED-touting TV called ‘The Wall’. Another reason why these displays are going to be so expensive to make is because of the higher resolutions that manufacturers will end up choosing. The higher the resolution, the higher the soldering accuracy that is going to be required, and that does not come cheap. As expensive and complex the process is, another problem for display manufacturers is how to bring forth those millions of tiny LEDs and merge them with a smartphone circuit panel. There are two ways to go about this. 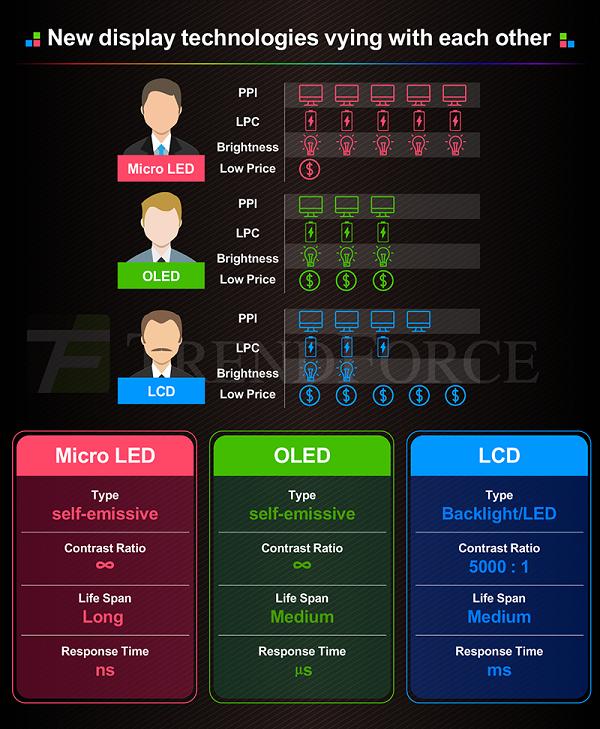 LEDs can be placed into a larger array, then be soldered on the smartphone’s logic board to form a complete display. Challenge: Accuracy issues in placing these tiny microLED components will arise. Wafer production methods can be exercised. This method is the most cost-effective and will be able to churn out more panels in a short amount of time. Challenge: This method is only suitable for devices that use a low-resolution display. This would explain why the Apple Watch family is sold in millions of units. Using a wafer production method for a smartphone display will only be possible if the manufacturer chooses to opt for a smaller resolution, and that is not going to happen in 2018. The highest resolution of the Apple Watch Series 3 is 312 x 390 and that is for the 42mm option. Imagine a microLED panel with a resolution of 2160 x 1080. The differences in the pixels are going to be miles apart and so will the cost. 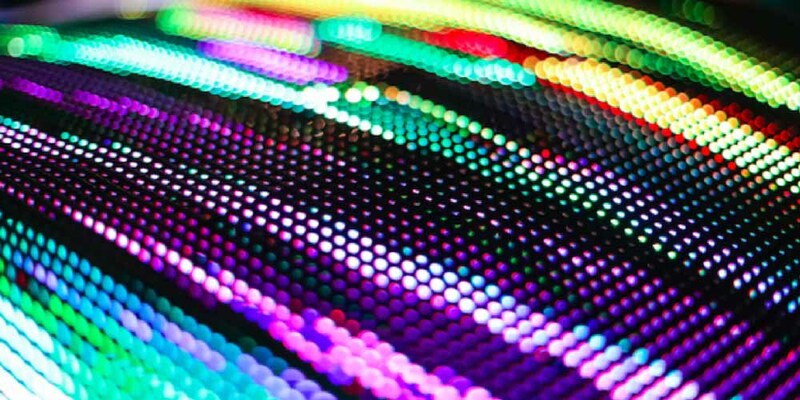 There are a lot of manufacturing hurdles that companies are going to encounter with microLED technology but if it turns out to a viable approach, then this display actually holds significant perks over OLED tech. Improved brightness to power ratio (measured in lux/W): What this means is that microLED will be able to achieve the same level of brightness as OLED while consuming less power. In fact, the latest iteration can be up to 90 percent more efficient than LCD and up to 50 percent more efficient than OLED. Longer lifespan: As you’ve all heard of the OLED burn-in issues taking place with smartphones, with Pixel 2 XL owners reporting this problem a lot, microLED will not exhibit the same issues. It is even possible for this technology to last longer than LCD panels before you start to witness shifts in color patterns. Higher resolutions in smaller form factors: Being able to see a smartphone with a 4K panel is going to be a common sight and will not just be limited to the Sony Xperia XZ series. Very high response time: Measured in nanoseconds (thousand times faster than microseconds, or the response time of OLED screens). Color benefits: This will range from higher contrast ratio, wide color gamut, and higher brightness levels. The perks that you’re seeing is only half the story. Let us take a look at the disadvantages that come with using microLED displays. Very costly: 3-4 times more expensive than OLED panels. Though this is just a single disadvantage, it branches out to more problems over time. Companies will be reluctant to invest in the expensive facilities and machinery that are required to make these sorts of panels. According to a source close to this information, Apple nearly dropped out of pursuing microLED panel manufacturing because of the complications and ridiculous costs that accompany this sort of venture. There will come a time when we see more and more companies gravitate towards microLED technology. For now, Apple’s Apple Watch will continue to feature this display but who knows? Maybe 3-5 years from now, we will be seeing phones, tablets and other consumer electronics boast microLED screen technology that will look great and give us meaningful battery life in return. Did you learn something useful today? Tell us down in the comments. Samsung Claims Its New Flexible OLED Smartphone Panels Are ‘Unbreakable’ – More Superior Than Gorilla Glass 6?